Ok, I just can’t resist the “cute animal” shot. When we were camping at Canyon Point last week, we were visited by a variety of wildlife during our stay, including squirrels, chipmunks, skunks, horned toads, and an assortment of birds and insects. The chipmunks are my favorite. They are a little more shy than the squirrels, but they are inquisitive enough to sneak up under your chair if you’re eating something that they think you might share with them. This guy had found a safe burrow under a tree stump that had been burned during the last wildfire that came through the area two or three years ago. He let me get close enough to get a few shots with the telephoto zoom, but he was definitely keeping a close eye on me! The photo was shot in raw NEF format, then processed to JPG in Paintshop Pro X3. I bumped up the contrast, used some Local Tone Mapping, and saturated the colors a little bit, as the raw file was just a bit washed out. 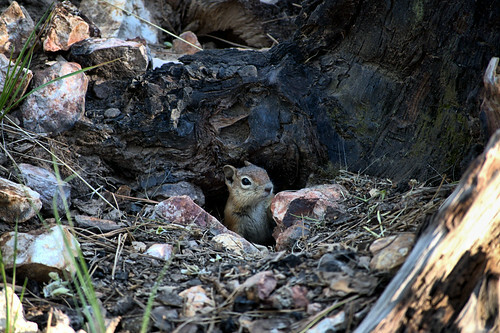 This entry was posted in Processing, Shooting and tagged animal, Arizona, AZ, camera, camping, chipmunk, D5000, Nikon, Paint Shop Pro, photography, software, wildlife. Bookmark the permalink.